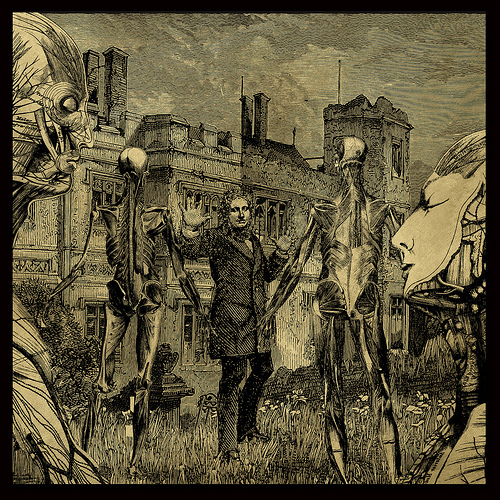 The Dead Will Outnumber the Living. Image © seriykotik1970 on Flickr. All this probably means that the living will never outnumber the dead, unless humanity's population explodes by several orders of magnitude beyond what we've already experienced. For what it's worth, one path to this might involve this estimate from the UN Population Division, which notes that, should 1995 fertility rates hold constant, the world population in 2150 would be 256 billion. See another discussion on this topic here. Flower Pot (2011) by Boon Mee, an elephant at Samutprakarn Zoo, Thailand. Image Source: New Scientist. More and more, scientists are using high tech devices to test the intelligence of extremely bright animals. The animals take well to the gadgets and gizmos we give them. But it is hard to know how much of this reflects a bizarre Millennial metareality, which exists between the tools we think we control, the realities the tools create, the human minds the tools mirror, and the animals' responses (both trained and independent) to this whole cloud of cognitive functions and related social messages. It's easier to see the problem regarding human research into this field prior to the introduction of high tech gadgets. In the 1950s, zoologists began giving chimpanzees access to paint and paper to test their intelligence. 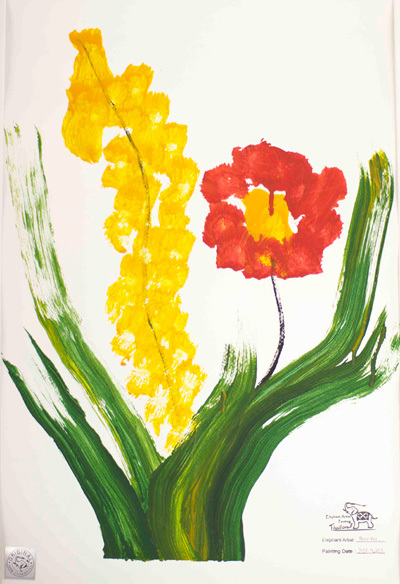 In London, there is an exhibition on right now (until 9 March 2012) at the Grant Museum of Zoology at UCL of paintings done by animals, including the above likeness of a flower, done by an elephant, named Boon Yee. While this painting surely must give us pause, the catch is that the elephant was guided in how he marked the canvas with the brush by having his ears stroked. 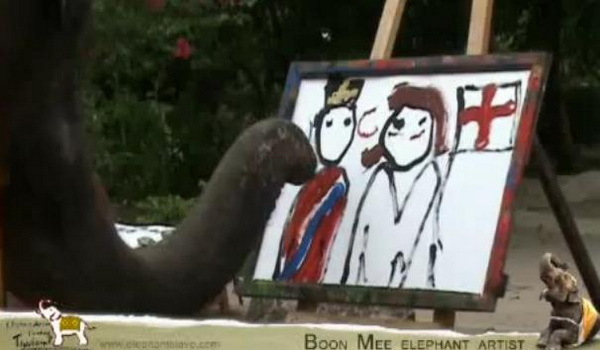 You can see another result below, when the elephant was guided to do a portrait of Prince William and Kate Middleton. It's all a bit literal-minded - and surreal. Do the animals enjoy these tasks? Are they moving from trained activities to creating something, guided or not? It is hard to say. You can see Boon Yee, who is a minor animal Internet celebrity, actually painting the royal picture below the jump. Other paintings by him, such as this one of an elephant, are shown on Youtube and apparently auctioned to the public for handsome sums by his keepers. Image Source: Daily Picks and Flicks. Incidentally, all artworks created by animals are not subject to copyright, because they are determined to be 'non-creative works.' This shows the inherent contradiction that arises when we hand an animal one of our tools. There is an odd imposition of the modes of human intelligence upon animals, such that we cannot trust what we witness, and we cannot really know what they think they are doing. It is almost as if we can only recognize intelligence if it is expressed or modified through tools that we developed to suit our bodies, minds and needs - a human-machine symbiosis we barely grasp within our own species, especially these days. In short, if an elephant paints a flower in a way that we would recognize, using a brush designed for our hands, even if the creature is guided (and clever enough to understand the prompts, desires of the human researcher, and even the desired outcome) then it is 'intelligent.' While this could be true, there is a two-sided mystery here about inter-species communication and humans' deep-seated dependence on their own tools, which clearly colours the findings. Just as a start, some of these projects assume that animals see the way we do, which they don't. Their eyes are formed differently. Also below the jump, a chimpanzee that does amazing, apparently superhuman computer memory games at a Japanese university (Hat tip: BBC via Thoughtware TV). What strikes me in the video below is how much the chimp looks like your average Couch Potato Web Surfer, snacks at hand. "Human cells carry 23 pairs of chromosomes, including one pair which determine gender." Image Source: SPL via BBC. 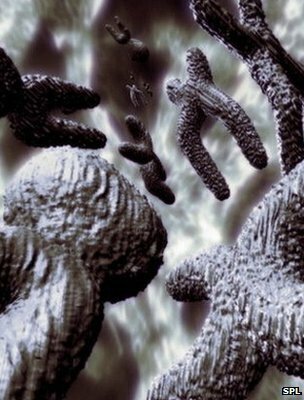 Geneticists are debating whether the human male will become extinct between 125,000 years (5,000 generations) and 5 million years from now. 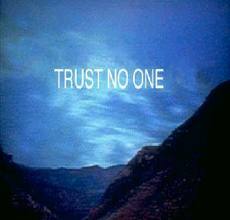 X-Files, Tagline from Season 1, Episode 24, "The Erlenmeyer Flask" (1994). Image Source: The X-Files Taglines. The political and governmental capacity of the Internet is evolving so rapidly that it outpaces all the analysts currently acknowledged as experts in the fields of international relations, political economy and foreign policy. Every world trade meeting, high end newspaper editorial, and talking head session coming out of the MSM outlets looks moribund and woefully out of touch. Acknowledged authorities on these matters go on about the gold bubble and the price of oil, unemployment and the Arab Spring. A China slowdown and tax policy. Nuclear Japan and nuclear Iran. Analyses are politically skewed, and the audience is expected to be passive. Viewers and readers are meant to believe what they are politically inclined to be told, whether or not those politics still reflect reality. No one in the halls of power observes that the pitched (and remarkably boring) right-left battle between global elites simply does not address current conditions. To start, take the growing gap between rich and poor, the growing sections of a crumbling, alienated middle class in developed countries, and the disenfranchised everywhere else. The broad consensus attained through prosperity (or its promise) has been pulverized. The old Roman trick of bread and circuses no longer keeps the mob pacified. The Internet itself became part of a series of marketed distractions, petty consumerist addictions, and cheap sham equalities. A gadget in every hand. But after the recession hit, neither right nor left formulas could hasten recovery, and the popularity of hacktivism increased dramatically. The online distraction became an obsession, and then almost overnight, the foundation of a new world. Meanwhile, the factor that authorities and commentators should try to understand, Cyberpolitics, is acknowledged by pundits via a superficial acquaintance with Julian Assange's shenanigans; or it is skimmed over out of ignorance; or it is derisively poo-pooed as the preserve of basement-dwellers and politically naive computer freaks, whose facility with the mysteries of technology is at worst unnerving. Since the province of computer hacktivism is virtual, it is deemed far removed from the gritty, physical day-to-day modern governmental realities of political parties, fund-raising, friendly think tanks and partial NGOs, lobby groups, private interests, intelligence reports, and back room deals. Instead of looking at and encouraging the positive governmental potential of the Internet, Cyberpolitics has been treated negatively as a security issue. Being a hacker target had, until recently, been deemed by firms simply to be a security problem for their in-house IT staff or for an out-of-house IT security contractor (that is, until the security contractors got hacked - it was embarrassing). In that climate, hackers become king. One glance at Twitter's #antisec feed, and anyone schooled in the history of politics, and more importantly, the structure of government, would start to wonder whether movements on the Internet could become the Millennial power groups. Beyond their pet causes, hacktivists might reshape democracy and anti-democracy, as well as the very form of the state. On the one hand, I see why someone would tweet: "The time to act is now. If youre waiting for November, then you still buy into the lies. There r no political parties." It is not just disenchantment and a bad economy. It is not just - as some critics have said - bad character of entitled youth. The Internet is changing the fabric of statehood itself. On the other hand, the blind support hacktivists receive is troubling. 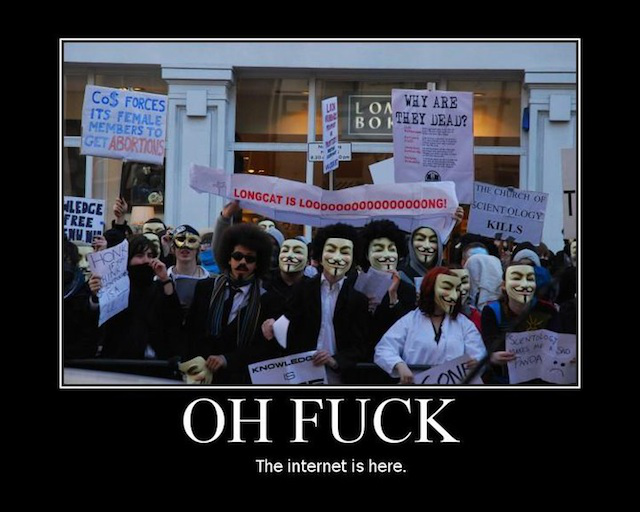 They adore Orwellian language: LulzSec and Anonymous have joined forces for Operation Antisec. The forces marshaled under this banner are following a pretty straightforward radical political agenda that appeals to any angry youth culture. On Friday, Anonymous targeted a private prison Website in Florida. Another attack took down an Ohio-based FBI affiliate, with its compromised site playing the 1995 Dangerous Minds Soundtrack hit, the Coolio redux of "Pastime Paradise" (incidentally, the song is based on J. S. Bach's Prelude No. 2 in C minor (BWV 847): listen here and here, and compare here and here - the provenance of modern media is amazing). WikiLeaks and Anonymous are promising more big announcements this week: "There's some massive win heading our (and your) way. We we we so excited! In the meantime we continue to root & leak & rm." Hackers have been steadily ramping up their rhetoric and actions from pranks to serious threats. It is already Monday 27 February in the UK, and while America watches the Oscars, WikiLeaks have begun publishing the Global Intelligence Files and over 5 million confidential e-mails of the Texas-based security company, Stratfor. It looks like Stratfor's site has been hacked at the same time as well, since they currently have a 14 February 2012 page up advertising: "Jihadist Opportunities in Syria." Tweets in the past few hours give the tone: "We aren't born under the law. Laws don't apply upon us.. we are legions." And: "Yikes RT @AnonymousIRC: A wild wiki leak appears: http://pastebin.com/D7sR4zhT | Bringing #Stratfor emails right in your face! #Antisec"
And: "http://is.gd/ZltFas @WikiLeaks to publish security think tank #emails | #Stratfor #Antisec"
And: "Greece Ministry of "Justice" Website http://ministryofjustice.gr has been Hacked and Defaced by #AntiSec #Anonymous Always Expect Us." And: "Something dark is churning in my heart. I like it. #AntiSec"
And: "#OpGoya2012: Academia de Cine / #premiosgoya... YOU´ BEEN HACKED!! #d0x http://www.pastebay.net/308294 #Anonymous #AntiSec We do not forgive." And: "Federal Trade Commission Server Breached By Anonymous #Antisec (#ACTA Protest)"
And: "#Cyberwar #Infosec University of Washington hacked by xdev @b4lc4nh4ck http://bit.ly/xuNqsb #Antisec #Anonymous"
As the actions escalate and the evolution takes hold, you have to wonder where this will all go. I sure miss the 80s, when we looked at tech with wide-eyed wonder and boundless optimism. The mood of the 1990s, the decade when popular access to the Internet was born, was awash in paranoia. This was the Dawn of the Paper Shredder, when the X-Files ruled the television. With its smoke and mirrors, virtual Potemkin Villages, invisible hierarchies, unknown authorities and special-access-class of users, I'm not sure the Internet was ever free, or ever lent itself to freedom. The Internet is very good at setting up online institutions that look like they are dealing with freedom when they are in fact dealing with its opposite.